If you’re a bakery or catering establishment, and you’re looking for that perfect bespoke baking and catering equipment then look no further. Get it right the first time with us and take the hassle out of everyday work, and get equipment made perfectly for you. From concept to completion, we guarantee that you’ll be given the best equipment around, designed to meet yours, and your customer’s needs. 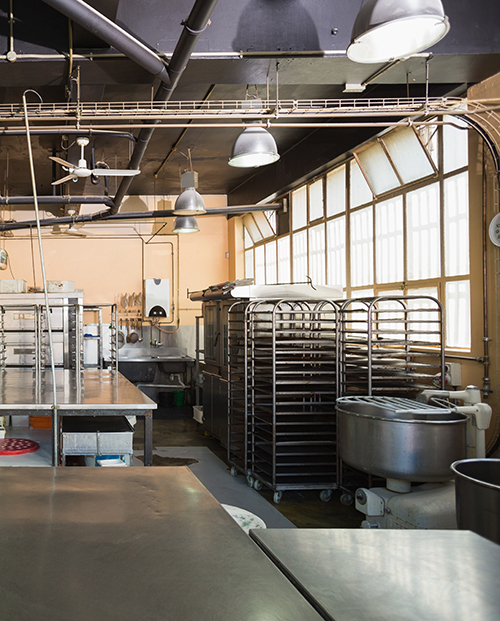 Trading for more than 14 years, Rackmaster fabricates and provides a wide range of products for bakery and catering establishments, both big and small. Beginning its life more than 20 years ago as a kitchen unit fabricator, founder Campbell MacFarlane (who has more than 40 years of experience when it comes to bespoke engineering work) noticed a gap in the market for bespoke bakery equipment services, catering for the independent bakery market. Since then the company has gone on to supply bakery equipment for a wide range of different clients, from the one-man band operating out of a small workspace, to those operating on a slightly larger scale with a bigger workforce, we’ve catered for them all. With an ability to provide equipment on a variety of scales, Rackmaster is large enough to bring you wide volumes of equipment, but still small enough to remember those caring, personal touches. These are all created and finished on-site at our 6,000sq ft purpose built manufacturing unit in Wickford, Essex. Once the products are completed our company owned vehicles will personally deliver them to you, if necessary. Providing top quality equipment, our products are crafted from the finest materials. Our speciality lies within oven racks and cooling racks, which are both crafted from stainless steel, we also provide baking trays, for ovens and cooling racks, created from aluminium. However, we fabricate most products, and can accommodate to fit your needs. So, if you’re working into the dead of night and need to order equipment out of hours, then you’ve come to the perfect place. Thanks to our new and improved website, you can now order your products online. You can also place your exact requirements and specifications, so we can get on with the manufacturing, while you continue to go about your business. It’s as simple as that. Whatever it is you’re looking for, we can guarantee that we’ll be able to accommodate you in some way, with our on-going commitment to ensuring every one of our customers has the best equipment around. After all, we want to ensure that your customers are happy too, and that all starts with us giving you the best bespoke baking and catering products to achieve success. Take a look around and see what we have to offer. Then either give us a call, or if you’re really busy, as most of you may be, just do everything online and we’ll do the rest. Rackmaster can fabricate a wide range of products for bakery and catering establishments. Our technicians have many years of experience in this business and specialise in short run stainless steel and aluminium fabrication. We are small enough to care, but large enough to cater for any size of order. Contact us at Rackmaster Limited to discuss your requirements. © 2017 Rackmaster. All Rights Reserved.